 Our Guarantee - Classic Remodeling NW, Inc.
WE WANT ALL OF OUR CLIENTS TO HAVE PEACE OF MIND - SO WE TAKE A DETAIL-ORIENTED APPROACH TO CONSTRUCTION WITH COMPLETE TRANSPARENCY AND HONESTY. Classic Remodeling NW provide our customers with a 3-year Guarantee instead of the 1 year industry standard. That’s one reason why you can expect a rock-solid guarantee to our clients of efficiency and accuracy, from our estimates following throughout the duration of the project. If you decide to add something to the scope of work, or if there are any changes to the scope of work after the proposal has been signed. Dry rot damage in the wall/floor cavity that was not evident from the outside of the wall/floor. Electrical – plumbing work that isn’t up to the electrical-plumbing codes that are hidden by the wall/ceiling coverings. We guarantee to you, our clients, that our estimator will be on time to the initial appointment or call at least 15 minutes before, to let you know the new time or to reschedule. If this does not happen we will give to you, your choice of either a $25.00 gas card or 1 hour of free carpentry time ($50.00) if you sign a construction contract. We do this because of our strong desire to serve you to the very best of our ability. At Classic Remodeling NW Inc. we consider a high level of communication to be a huge part of a successful construction project. With that in mind, here is our company policy on how we will communicate to all of our clients. We make it our personal goal to answer all weekday phone calls during normal business hours (8:00am to 4:00pm) within 2 hours of you leaving a message. You will get a live person when you call during normal business hours (8:00am to 4:00pm). All E-mail messages will be answered at the latest within 24 hours of us receiving them. Every project will have a communication board in the construction area for easy communication between you and the lead carpenter. Every client will receive the phone numbers of the Project Manager, Lead Carpenter on the project, and the Office. We ask that if your question/concern is not an emergency that you call during normal business hours (8:00am – 4:00pm) to allow our employees time with their families. We understand that almost all problems between a homeowner and contractor can be contributed to a loss of communication or assumptions that have been made. With this in mind we tend to over communicate with our clients so they know about all aspects of their project to guarantee they are kept informed. Prior to beginning a project, we have a pre-construction meeting with the clients, salesman, lead carpenter and the project manager to go over all aspects of the project and to make sure any and all questions have been answered before we start. Throughout the project, we have a weekly meeting with the clients to go over the progress made during the prior week and the expected progress in the next week. The project schedule is always reviewed in this manner to ensure the project runs smoothly. Finally, we pride ourselves in making everyone from the Classic Remodeling NW team available by phone for the duration of the client’s project. We make communication a top priority. All new referrals that qualify for this program must sign a construction contract first. I just wanted to let you know what we feel great about with the way our project is going so far. We really appreciate that we have the consistency of a few people working on it. So far we have worked mostly with Paul. Paul has been wonderful about communicating what is happening with us and discussing the next steps and when he will be here. We also greatly appreciate the care he has taken in keeping the property safe. For example, he put a long board nailed over the old door so we would not have anyone accidentally go out that door and he also marked a deep hole to avoid anyone falling into it. Most likely, none of those things would never happen, but we appreciate that he is aware of what could happen and plans for it. It just feels like there is a lot of thought and care put into the job. Thank you so much. READY TO GET STARTED ON YOUR HOME REMODELING PROJECT OR CUSTOM-BUILT DREAM HOME?